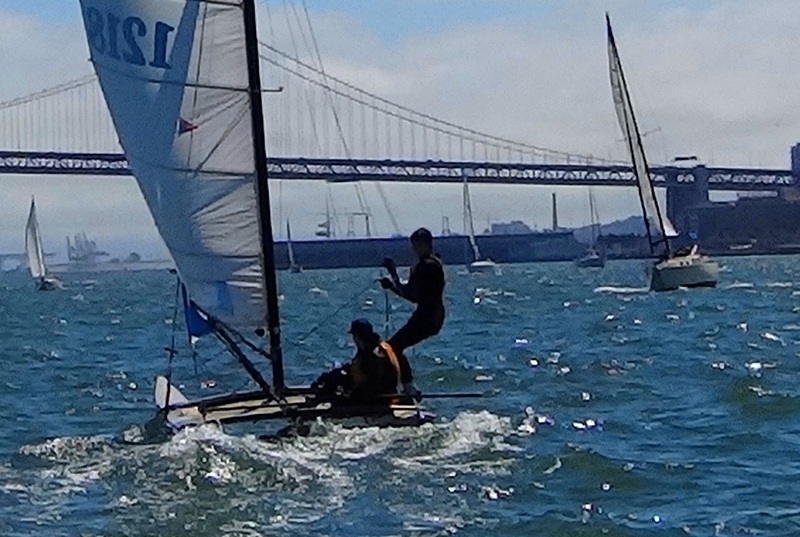 My son Wesley and I decided to go watch one of the America’s Cup sailboat races happening in the waters off San Francisco, and do it from our own boat out on the water. Our boat is a Hobie-18 catamaran, one of those zippy little two hulled boats that become very fast when the wind comes up. Spray will fly, one of the hulls will lift out of the water and one of us will hook on and stand outwards from the side of the boat to provide a counterweight to the wind. I find it marvelous fun to do this, flying along sideways over the waves, alternately crouching or stretching out, completely sensing how my body movement controls the power of the boat this way. I become an extension of the boat, as it becomes an extension of me. I love those moments. The 2013 America’s Cup is also sailed with catamarans. They are huge. Seventy-two feet long and forty-six feet wide. On my little cat, when we change directions, the two of us switch to the other side by kneeling and scooting over. 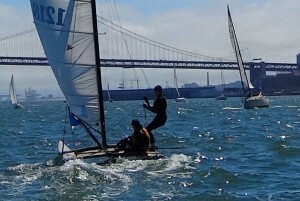 On the big AC boats, the crew of eleven sprint across a taut net stretched between the two hulls. 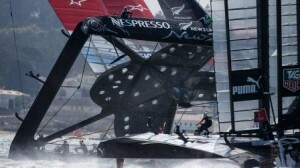 The mainsail is really a high-tech carbon fiber airfoil, more wing than sail, larger than a 747 wing turned straight up. This wing produces so much driving force that the boats rocket across the water in a strong breeze, vastly exceeding the speed of the wind, going almost fifty miles per hour. That’s fantastic speed for a sailboat. They like to “fly a hull” like us Hobie sailors because once the hull is out of the water, its drag is eliminated and speed is increased. They’ve figured out how to lift both hulls out of the water so that the entire 13,000 pound boat is flying along several feet above the water, supported on a hydrofoil the size of a surfboard extended down into the water. Amazing stuff. Our big day started at the boat ramp of the Berkeley Marina under overcast skies and winds so light that we had to paddle down the channel, awkward at best on a catamaran. Soon we were starting to overheat in our wetsuits and feeling like the day was going to be a big bust. But I had faith that San Francisco Bay would deliver the goods. I was right. Soon enough the breeze freshened and we were under sail, aimed right at Angel Island. The sun burned off the overcast; the wind and waves began to build, and Wesley was hiking out to control our lean. Race number eight would be happening just fine. A few long tacks later, we arrived amid a big flotilla of boats of every size next to Alcatraz seeming to bob in place waiting for the race to start over two miles away near the Golden Gate. Most boats were using their motors to move about at very slow speeds just to be able to steer and avoid each other and to keep from crossing over the course boundary marked by a few official boats flying America’s Cup red flags. And then there was us, with no motor, with our mainsail positioned to catch the least amount of wind, occasionally sheeting in the sail just enough to get sufficient motion to steer around and between the various boats floating across our path. As the smallest and most maneuverable boat out there, I was happy to do most of the dodging and weaving. Hobie Cats hold a special place in the hearts of many sailors, who remember them sort of like the sailing equivalent of muscle cars from their youth, so we received a few shouts of encouragement. I occasionally threw a glance towards the Golden Gate bridge in the distance to confirm that the race was happening. The two leviathans, known by us simply as “Oracle USA” and “the Kiwis” were distant, but so big that we could at least see they were on the water and know that we had a race coming our way. We knew we wouldn’t be able to watch every nuance of the race by showing up as a spectator at one end of the course, but we would certainly be immersed in the reality of it. The wind and swell affecting the race would be the same wind and swell that rocked our boat. By being next to Alcatraz we would be as close as we could be to one corner of the race where some of the turns would happen. Some minutes later, we watched the two boats grow in size until their speed and scale could finally be comprehended. They loomed larger and larger until tiny human figures could be seen moving about onboard as they worked winches or pulled lines. It was unreal. 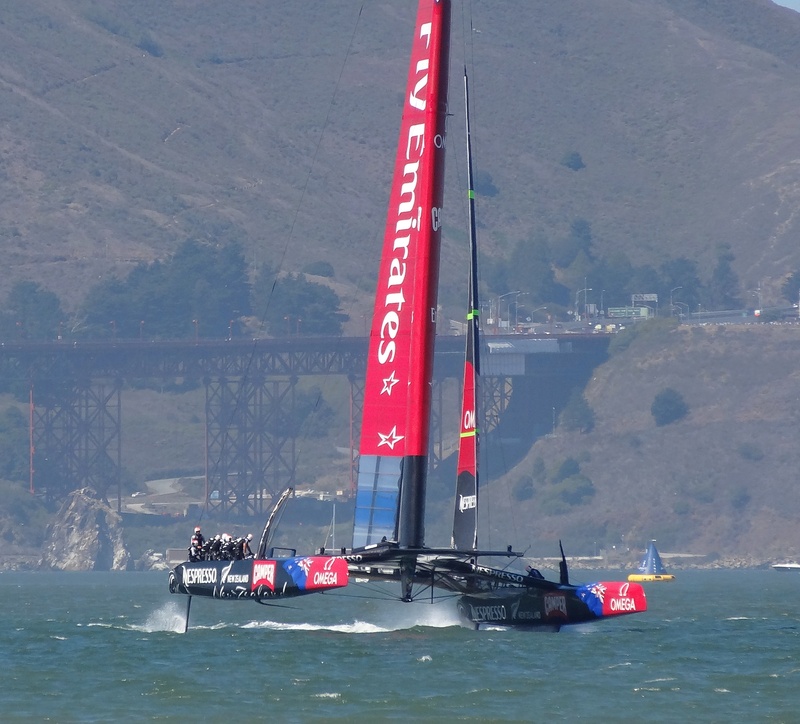 The Kiwis passed first and angled away from us and then Oracle USA swung a wide turn around the big inflated buoy just a hundred yards from us. Part cruise missile and part magic flying kayak, it rocketed along eight feet above the water with a thin fin sticking down that left a white trail of spray in the water like a contrail. It was cool as could be. We watched them sail off and then decided to sail into an even better viewing position for their return to this end of the course. I sheeted in and let the wind grab us. As we zipped along the edge of the course boundary, a motorboat displaying an America’s Cup flag could be seen trying to catch up to us. “Hey, it’s Chris!” said Wesley. On board were the familiar faces of Benicia sailing buddies Josh R who was steering, and Chris S who was aiming a camera our way. There were big smiles all around and we tried to yell things at each other for a bit. Soon they zipped off to resume their duties. When the two big boats returned to pass us one last time on their way to the finish line we were surprised to see Oracle USA with a solid lead, a rare sight in those early races before Oracle found the extra speed that would make the later races more competitive. Later I saw video highlights of the drama that occurred at the far end of the race course that almost ended it all for the Kiwis when they were caught in a rare moment of bad coordination. Two grinders in control of the hydraulics that shape the curvature of the big wing had lagged in their response during a quick tack and the powerful wind sent their huge boat slowly teetering up and sideways. It was sickening to see the underside of that craft so unnaturally exposed this way and then see it worsen as it continued to roll upwards towards a terrible tipping point while the crew frantically worked their controls to stabilize it. Then the big boat came back down. Catastrophe averted, just barely. The American boat had to cut to the right to avoid being struck by the falling boat, but kept up enough speed to take the lead and then the race. 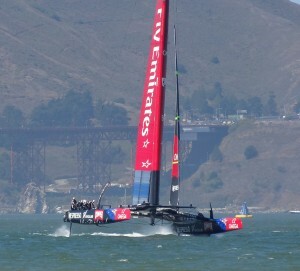 In the days that followed, Oracle fine-tuned their boat to find more speed and also caught up to New Zealand in tactics and technique, making the races more even and eventually favoring the American boat. Hey, I just wanted to see good close races. For me, it’s been easy to secretly pull for the Kiwis as they became the true underdogs. Their team is made up almost entirely of New Zealanders and they are sponsored by a bunch of New Zealand businesses. Team USA is paid for by computer giant Larry Ellison. As in Silicon Valley, the talent is mostly hired from abroad. The fact is, there are hardly any Americans on Team USA. The Kiwis are a plucky bunch, taking on Goliath and winning until Goliath woke up and became determined to do better. A New Zealand win would thrill that tiny nation, whereas an American win would hardly be noticed here. But then, a US victory would keep the next America’s Cup in San Francisco, with more opportunities for future adventures like I just had. So I could be happy with either outcome, and that was fine with me.